When two or more motorcyclists travelling together are involved in a collision, there’s often considerable debate and occasionally an element of confusion over who is to blame. In group riding situations, an incident at the front can have an adverse effect on following riders. 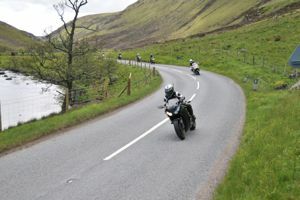 If an incident occurs on a sharp bend on a country road with a lead motorcyclist, those following can find themselves unable to avoid a hazard or an emergency situation. Careful judgement and discipline are required in group ride-outs. The highway code stipulates that we should ride at a speed that allows us to stop well within the distance we can see to be clear but it’s not always that straightforward and this is reflected in judgements with liability attaching to a lead car or a leading motorcyclist. Questions are often asked about whether a leading rider has a duty of care to his following riders. In group ride-outs, most, if not all, of the motorcyclists involved, are friends and the last thing we want to think about is a potential claim but we have included some cases below which illustrate situations which can arise in leading and following. To find out how the Courts have approached cases involving motorcyclists leading or following each other, please have a look at the decisions below. Remember, no two cases are the same: your case is unique, the accident circumstances are unique and each case is fact sensitive.